Haldeman's addition to Gateways is, thus far, one of the best stories in the lot (granted, by this point, I've only read three). "Sleeping Dogs" is another military-related science fiction story set some time after an interstellar war. Flann Spivey is an ex-soldier-turned-futuristic-psychiatrist whose job is to aid people who have essentially become immortal on their journey towards ending life. In particular, he serves other ex-military by helping them recover lost memories -- memories, we learn, that were taken away from them at the end of the war. Spivey, however, has also lost memories, and has decided to return to a mining world on which he believes he once fought in order to recover them. an allegory of U.S. involvement in Central and South America. The Latin flavor to the story and the culture within it attest to this fact. But the most compelling part of the story is Haldeman's continued reflection on humanity's pension for warfare and its consequences. "Sleeping Dogs," provides an afterwards-view of the soldier: Who do they become when the war is over? What do they do with themselves? And what do they do about what was taken from them? The memory loss, consequentially, serves both as a disturbing "evil" that allows us to sympathize with Flann, but it is also a small mercy. Soldiers today go to war and come back with the incomplete scars of things they remember in full, half remember, or have thrust upon them in flashbacks (PTSD). But Haldeman's vision is both more sinister and reasonable: soldiers return with their scars, but without the memories to go along with them; instead, the best they can hope to find without deep medicated psychotherapy are their military records, which, we are led to assume, are intentionally made inaccurate. The mercy is made readily apparent: only those who have grown tired of exceedingly prolonged life (hundreds of years) might want to know what they really did all those centuries ago in those long-forgotten wars. All this is packed into a single short story, which I found thrilling precisely because it made me think and ask questions. The only thing that bothered me about "Sleeping Dogs" was the fact that Flann Spivey and the world/universe in which he lives are begging for a novel length treatment. Perhaps we will never see that novel, in part because it would be unfairly compared to The Forever War, but after reading "Sleeping Dogs," I couldn't help wanting to know more. I wanted to learn about what happened to Spivey after his discovery and the other folks who suffered similar fates. And when we get right down to it, maybe my desire for more is really a good thing after all. "Sleeping Dogs" is one of the best short stories I've read in a while. If you don't have it, get Gateways and read it. It's good stuff. Real good stuff. 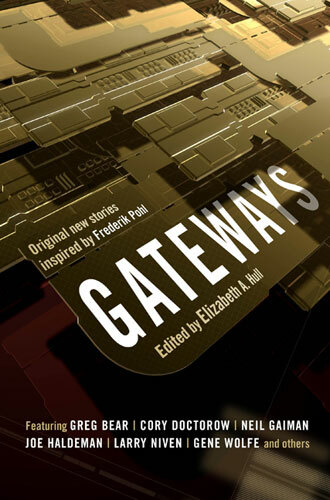 The above is the continuation of my story-by-story review of Gateways edited by Elizabeth Anne Hull.